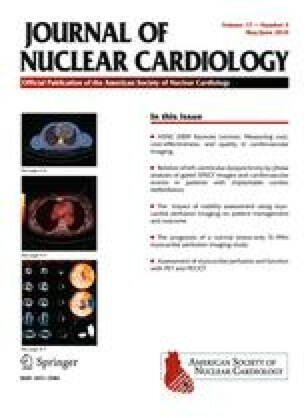 The aim of this study was to assess interassay reproducibility of myocardial perfusion gated-SPECT for calculation of end-diastolic volume (EDV), end-systolic volume (ESV), and left ventricular ejection fraction (LVEF) in patients with atrial fibrillation (AF). One hundred and fifteen consecutive patients with AF from three participating hospitals (mean age 68.9 years, 39 women) were included in the study. All patients underwent two image gated acquisitions at rest with a 30 minute interval between them. Quantitative data were obtained using the QGS and ECT software algorithms. Heart rate was similar in both studies: 74.94 ± 15.2 vs 73.03 ± 15.57. QGS yielded an LVEF of 54.4%/53.8%, an EDV of 100 mL/101.5 mL, and an ESV of 51 mL/52.3 mL; and ECT showed an LVEF of 63.6%/62.9%, an EDV of 125.8 mL/127.4 mL and ESV of 54.1 mL/56.3 mL. Correlation between the two acquisitions was high (>0.948) for both methods for LVEF, EDV and ESV. Regression and Bland-Altman graphics showed a good agreement between all parameters. Interassay variation coefficients for each method (QGS/ECT) were 5.29% vs 4.83% for LVEF, 4.94% vs 5.17% for EDV, and 9.94% vs 12.78% for ESV. Interassay reproducibility of LVEF and EDV with gated-SPECT in patients with AF is good, whereas for ESV it is suboptimal, particularly when ESV is small. This study was conducted for the RECAVA Investigator’s Group RECAVA (Cardiovascular Disease Research Network). This study was supported in part by grants from the Cardiovascular Disease Research Network (RECAVA), Instituto Carlos III [(Red C03/01, RECAVA Researchers (Red Temática de Investigación Cooperativa en Enfermedades Cardiovasculares)]. We thank Joan Castell-Conesa (Department of Nuclear Medicine), Gustavo de León (Cardiology Department, Hospital Universitari Vall d’Hebron, Barcelona), Carlos Peña-Gil (Cardiology Department, Complejo Universitario Hospitalario, Santiago de Compostela) and Alfredo Bardají (Cardiology Department, Hospital Universitari Joan XXIII, Tarragona) for their invaluable assistance. The authors have declared no conflict of interest.